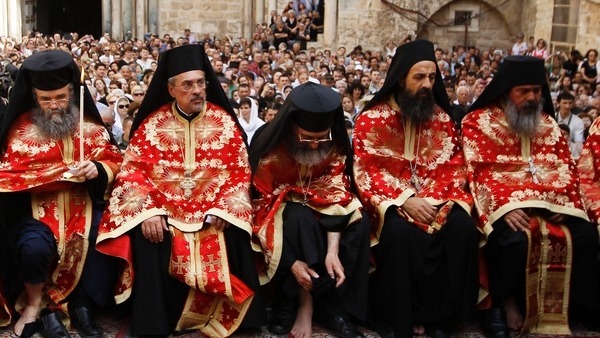 Greek Orthodox Patriarch Theophilus III washed the feet of 12 of his clergymen in the courtyard of the Holy Sepulchre Church in Jerusalem’s Old City on Thursday (May 2), in a traditional ceremony that takes place three days ahead of Easter.According to Christian faith, Jesus washed the feet of his twelve disciples prior to the Last Supper before he was crucified. Christian churches world-wide commemorate this event on Thursday – known as Maundy Thursday – as part of Easter Holy Week celebrations, with Orthodox ceremonies taking place in accordance to the eastern calendar. The washing is usually done by the highest ranking clergyman as they emulate the act of Jesus. Thousands of worshipers and onlookers, many of them local Palestinian Christians who live in or near the Old City as well as pilgrims from all over the world, watched the ceremony from inside the courtyard and on nearby rooftops. The ceremony was held at the Church of the Holy Sepulchre, the most sacred site for Christians who believe it to be the place of Christ’s crucifixion, burial and resurrection. The church was built by the Roman emperor Constantine and rebuilt by the Byzantine emperor Constantine Monomachus. It has survived fires and earthquakes.